Mildred Westervelt Warner, the only woman president of a major integrated paper company, led Gulf States Paper Corporation for over 20 years. She began her career with EZ Opener Bag Company of Illinois and moved to Alabama in 1928, when Gulf States Paper Corporation (EZ's successor company) was incorporated. She became executive vice-president at that time. In 1938, she became president and served in that position until 1957. Her sensational career in the paper industry is well known to industrialists throughout the nation. She was, indeed, a pioneer. Long before the rise of women to executive positions became a public issue, she proved that the roles of homemaker and mother, community worker, and industrial executive are compatible. Mrs. Warner achieved much as an executive leader. She created a professional forestry organization to handle the forestry affairs of Gulf States. In 1948, she guided development of a program in which company foresters advised private Alabama landowners in developing sound forestry conservation practices. In 1953, she established the Westervelt Game Preserve, and in 1956, she was instrumental in employing the first corporate specialist in forest game management in the South. This specialist advised in the development of an overall game management program, which is now widely copied. In 1948, Mrs. Warner directed the expansion of the Tuscaloosa plant, almost doubling plant capacity. She saw the need to expand the company's limited product line. In the early 1950's she developed the mill at Demopolis, which marked the first installation in the paper industry of a continuous digester for making highly bleached market pulp. After her retirement as president in 1957, she served Gulf States for two years as Chairman of the Board. In her retirement, Mrs. Warner devoted her energies to philanthropy. Churches, educational institutions, libraries, orphanages, YMCAs, and scouting were among those who benefited from her generosity. The University of Alabama awarded Mildred Westervelt Warner an honorary Doctor of Laws degree in 1956. She was awarded the First Citizenship Award of the Tuscaloosa Civitan Club and the Woman of Achievement Award of the Tuscaloosa Business and Professional Women's Club. 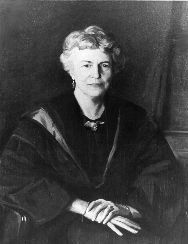 Mildred Westervelt Warner received many honors during her lifetime. Her memories are a statewide program of forest conservation and a thriving company providing thousands of jobs.